“Anyone who thinks he understands Israel, hasn’t been fully informed.” I don’t recall who said it first, but it’s not an uncommon conclusion among those who do understand Israel. Complex and complicated, Israel is, nevertheless, loved and lauded. 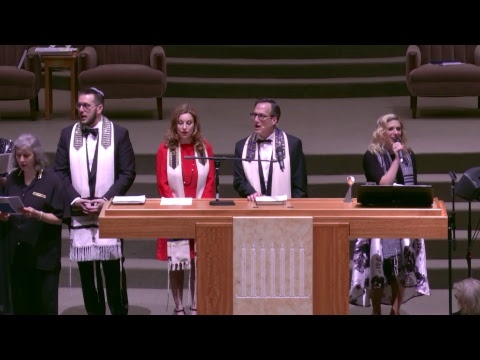 On Monday, October 22nd, Ambassador Ron Dermer, Israel’s Ambassador to the United States, spoke from the bimah at Congregation Beth Israel before a crowd of over 800 people. After I welcomed the community and offered my remarks (below), Consul General of Israel to the Southwest Gilad Katz, spoke warmly to us about the strength of Houston’s Jewish community and its relationship to Israel. Then he introduced Ambassador Dermer. For 40 minutes, Ambassador Dermer informed and inspired us. He was diplomatic about identifying and respecting others’ points of view while he clarified the context from which he offered his. On every issue from security, national identity, pluralism, and technology, he didn’t demur from stating facts that supported his positions with passion and commitment. He said that, like him or not, President Obama and President Trump have each done some good for Israel. But, he emphasized that President Trump has done what no other president or individual has done for Israel, when he moved the U.S. Embassy to Jerusalem. On the Iran deal, Dermer explained the danger embedded in the deal and that Trump was correct to withdraw from it. His comparison of Trump to Cyrus the Great was overdone, in my opinion, but in the context of his message the point was clear enough. Dermer ended with an apt image. Though Israel’s cup is full, our Jewish history and Jewish memory lead us to see that it’s still 1/16 empty. So, he urged us to see that Israel’s cup is actually overflowing. Indeed, anyone who has visited Israel in the last few years or on a recent trip with Beth Israel, will attest to Israel’s vibrancy and potential. Problems there are, and Israel isn’t perfect, which Dermer acknowledged, but Israel’s gifts to the Jewish people and the world have placed it among the world’s greatest nations in innovation and GDP per capita, in just 70 years. Though peace eludes us, it is never far from our thoughts as the ultimate hope for Israel and the Jewish people. My remarks follow, which Ambassador Dermer referenced in his own remarks when he reflected not only on Israel’s needs but also on our needs as a committed Jewish community in Houston. Rabbi David Lyon’s remarks on the occasion of Ambassador Ron Dermer at Congregation Beth Israel, Houston, TX, October 22, 2018. We’re all Zionists, because we all believe in Israel’s right to exist as a sovereign state and to be the homeland for the Jewish people; currently home to more than 6.5 million Jews. For us, Israel is more than a boundary drawn on a map — or anyone’s version of a map. It is a home for Jews to be Jews and to fulfill their biblical and prophetic destiny. It isn’t just the result of post WWII and Nazi Europe; it is the result of 2,000 years of hope and prayer that the exile would end. And, it did end in 1948. My generation grew up in the midst of the Six-Day War. We agonized with our parents during the Yom Kippur War, and we marched for the freedom of Soviet Jews. We were told that peace would be in our future. This month, I had my 56th birthday, and peace in the Middle East still eludes my generation. It has also eluded yours, so we must look again to the youngest among us to keep dreaming and working for the peace we were told was possible. But, like many of you, I’m worried about the youngest generations. Their hopes for Israel depend on secure borders, pluralism in the streets, and progressive Judaism in the synagogues. And, they’re growing impatient with us. We’re growing impatient, too. So, tonight is critical for every generation of Jews. The tie that binds us is our love of our people and the Land of Israel. We are all Zionists. We are all dreamers and builders of the Jewish future. There is no “road map” anymore; and Google can’t help us get from here to there, either. But, tonight, Ambassador Ron Dermer is “hamakor,” our best source of information, insights and inspiration about all things Israel. We’re grateful that he is here to speak to us, and I’m always impressed by the remarkable turnout of Houston’s deeply engaged Jewish and larger community.